Ben’s Bus operates a Lyon Airport to Bourg St Maurice ski transfer service on Fridays, Saturdays & Sundays during the 2018 / 2019 ski season. Bourg St Maurice is a town at the bottom of the mountain and the transport hub for many ski resorts. 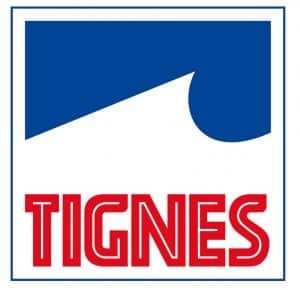 If you need to get from Lyon Airport to Val d’Isere, Tignes or St Foy, we probably have a bus that will take you all the way there, so there is no need to get off at Bourg. If you are heading to, Les Arcs or La Rosiere, then please scroll further down this page so you can see the information on our service from Lyon Airport to Bourg St Maurice and onward transport options to your resort. 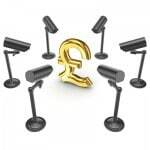 These sections also give you more exact information about our services. The transport connections from Bourg St Maurice are very good and very regular. More details can be found in the below section “Onward Transport from Bourg St Maurice“. This will show you the different travel options available to take you to your final destination, including taxis, private transfers, public buses and the funicular to Les Arcs. 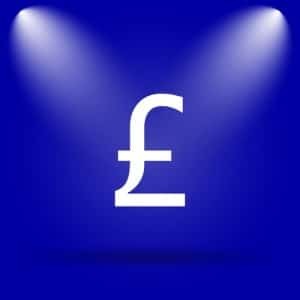 We pride ourselves on offering the cheapest shared transfers on the market whilst still offering a fantastic service. Our shuttle buses are regular and timely and on weekends we have many staff to help your journey go smoothly. Our prices from Lyon Airport to Bourg St Maurice are £87.80pp Return, but with our group discounts, you could pay as little as £77pp. We also have discounts for children under 12 (35% off) and Young Persons under 26 (15% off). Click this link to Book Now or get an Instant Quote. We believe we are the cheapest way of getting from Lyon St Exupery Airport (LYS) to Bourg St Maurice. 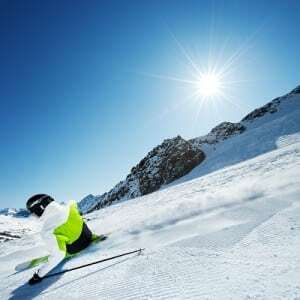 If you cannot find the information you are looking for in a section below, we may have it on our Bourg St Maurice Airport Ski Transfers page, our Lyon Airport Ski Transfer Questions page or our Lyon Airport page. We also have airport buses from Geneva Airport to Bourg St Maurice & Grenoble Airport to Bourg St Maurice. Other Days of The Week: We do not operate this service on other weekdays. We would recommend taking the shuttle bus service from Lyon Airport to Grenoble city centre. From Grenoble you can take a train to Bourg St Maurice with SNCF, or check out Altibus for details on public buses. Alternatively, you could book a private transfer from Lyon Airport with Actibus. – On the 14th, 15th & 16th December 2018 we only have services from Lyon airport to Bourg St Maurice. There are no surcharges for travelling on Sundays or weekdays. 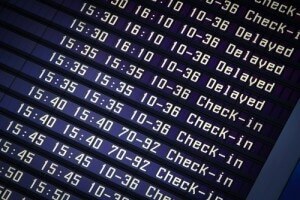 The transfer time between Lyon Airport and Bourg St Maurice is usually between 2 hours 45 minutes and 3 hours 15 minutes, covering a distance of 188km. These times are approximations. Please remember that expected journey times are difficult to predict in the mountains due to weather and traffic conditions. 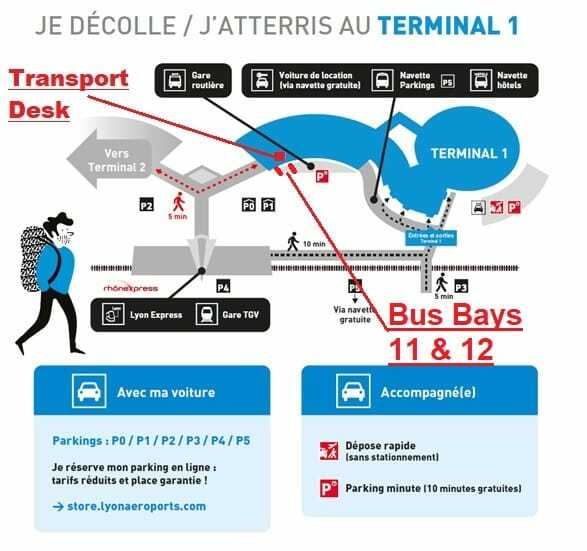 Our coaches to Bourg St Maurice depart from either Bus Bay 11 or 12 of on the Ground Floor of Terminal 1. There is a Transport Desk and, on Saturdays, a dedicated Ben’s Bus desk just inside the main doors opposite Bus Bay No. 2. Our reps will be wearing blue Bens Bus uniforms. where does the bus stop in bourg? 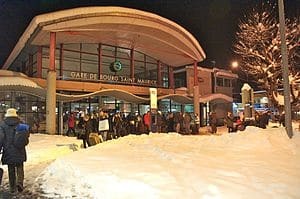 We will drop you off at and pick you up from Bay Number 13 of the main bus station in Bourg St Maurice, the “Gare Routiere”. This is the bus and train station, which can be located in the centre of town. From here, you can get onward transport with the local bus network, Altibus, and it is a short walk to the Funicular station, which will take you up to Les Arcs in minutes. We do ask our customers to keep an eye out for our vehicles as the bus station can get very busy and it is not always possible to park at Bay Number 13. Our services may not be listed on the TV screens, so look out for a bus with “Ben’s Bus – Lyon Airport” in the window or ask a driver for help. Bourg St Maurice is a large town and the bus station is located near the centre, on the main road the goes through the town. It sits right next to the train station and together they are known as the “Gare Routiere”. We usually pick up and drop off at Bay No 15. However, we may pick up from a different bay number so please be alert for any vehicle with a Ben’s Bus sign in the windscreen. Please note that our bus information will not appear on the TV screens in the waiting area.